And it's written in the pages: "Do just like they should"
Initially, fans were aware of "Woe On Me" from his radio appearance on KCRW in 1995. Beck was there warming up for the next night, when he was to open for Johnny Cash, and so he tried out a handful of unheard songs and blues covers. For many years, this song was referred to as "Feel The Strain Of Sorrow" by fans (and even in Beck's introduction of the song, he said it was unnamed). The song was long forgotten by Beck, a one-off type thing, but also I think one of the more popular obscure tracks among fans and collectors. 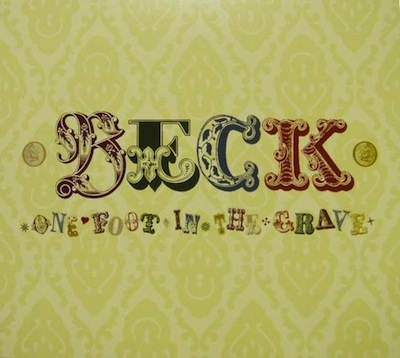 Then fourteen years later, in 2009, Beck put together a deluxe version of One Foot In The Grave. One of the tracks he added was his recording of this song! As Beck had explained on KCRW, originally the song was snappier, fancier, before he decided it should be more somber. Hearing the studio version indicates that this is true. The guitar is certainly snappier. And while most of the verses are fairly identical, he did originally have a wordier chorus. This wordier chorus gave the song it's official name of "Woe On Me." Beck introduced his KCRW performance by sharing that this was of a "series of songs I wrote about this character...who lived about a hundred years ago." I don't know exactly which other songs are in this series, but probably "Fourteen Rivers Fourteen Floods" (this song alludes to fourteen rivers, must be a key part of Beck's made-up mythology) and "Curses" (performed at the same KCRW show) were some of them. And knowing the song takes place so long ago really brings it into focus. I mean, there really is not any evident story in "Woe On Me," but it is a tale of a vagabond, going from desert to towns to rivers, only at home on the journey. We see lines and images like this throughout Beck's career, even on later things like Odelay. Beck's always found interest in writing about a drifter, traveling without a specific home. He rarely romanticizes it to any big degree, but knows that sometimes drifting is a necessity. He hints at a troubled past ("I killed for no reason") and recognizes his lot in life: "I barely cried / Wherever I'd ride I found a home." He is running to forget, to be able to empty his head and finally feel peace, to feel more free. While I love the less wordy KCRW chorus -- the turn of phrase "feel the strain of sorrow never ceasing" is remarkable -- the longer chorus on One Foot really sharpens what is a fairly vague tale. There can be a fine line in a vague song between maintaining meaning and feeling like a blob of words. Beck does a remarkable job here keeping that character/story in focus, without being too revealing. Beck's youthful voice, combining with the ancient images and lyrics, made his performance on KCRW special. This sadly is the only known performance and arrangement of the song.